Within the tidal wave of ideas washing across Western Manufacturing in the latter half of the twentieth century and being cited as the reasons for Japanese products taking over the world was something called ‘Total’ Quality. We heard that the Japanese were so much better than us that they measured quality in terms of ‘parts per million (PPM) defects’ and achieved single figures. When we recognised that we measured in terms of percentage and that a 1% failure rate is 10,000 parts per million we knew that we really were in a different league. At first many of us were probably cynical about this. During the 1970s and early 1980s Japanese cars – which, after all, was the industry held up as the role model for the Eastern way of doing things – didn’t have a particularly high quality feel to them. The Toyota Corolla came from the home of what we later came to describe as ‘Lean’ but it felt cheap. Could this really be Total Quality, we wondered. We came to realise, of course, that it was a quality product when reliability and customer satisfaction statistics were published. Toyota certainly had far lower Warranty costs than Western competitors and presumably far less internal costs of scrap and rework. As we learned more we understood that ‘Total’ was probably a good term for the Japanese approach to quality. The biggest difference between what we heard from Japan and what we saw in our own place of work on a day-to-day basis was that quality was everybody’s responsibility rather than that of the Quality Department. So, did the Quality Manager have an easier ride in a TQM environment? Surely he or she must, if other people are doing part of his or her job? But, no. In a TQM environment the Quality Control Department is now Quality Assurance, responsible not just for inspecting and trapping problems, but for sorting out the processes so that there are no faults to be picked up by inspectors. The Quality Manager has a much broader range of responsibilities. Thus we all realised that there had to be something in all this. TQM had to be investigated. As we learned more it was particularly galling – especially for our American friends – that the fathers of TQM held in most reverence in Japan were probably Dr. W. Edwards Deming and Dr. Joseph Juran. We heard that in their search for economic recovery after World War II the business leaders in Japan looked to Americans for guidance. We also heard from some speakers on the subject that Western quality gurus were only too willing to promote their ideas in a market where they would be given credence, as opposed to the grudging lip service they received at home. Deming’s specialism was Statistical Process Control. He firmly believed that management needed to understand the impact of variation in all aspects of product creation and take action to minimise this variation. Although in later times he is equally well known for the ‘Deming Cycle’ (Plan, Do, Check, Act) his contribution to TQM in Japan was corporate recognition that standardising component dimensions, material hardness, surface finishes, and so on would reduce quality costs. As well as establishing SPC as the technique by which this standardisation could be achieved Deming succeeded in creating the management recognition of their responsibility for such matters. This is where Juran’s primary skills merged to form the broad-based approach we now recognise as TQM. Juran helped re-define quality in terms of meeting customer requirements and brought with him the concept of the internal customer. He also introduced the role of ‘Quality Council’ whereby responsibility for quality was spread across the organisation. As noted above this was probably the first fundamental difference. The QA function of a TQM operation is the team that assures quality within the business. QA engineers work with people throughout the organisation on the root causes of problems, defining and documenting different ways of working. At the same time inspection is now the responsibility of far more than Quality. People who produce are responsible for inspecting what they have made. We learned that we can’t inspect quality into product if the manufacturing processes or environment aren’t appropriate for the specification being sought. Inspection is something we may need in order to avoid problems further down the line and to highlight process failings, but it doesn’t add anything per se. Our objective has to be to assure getting things right from the outset, with inspection built in where we have doubts, perhaps after a series of problems and where the resulting process revisions haven’t yet been proven to prevent recurrence. Quality circles are probably the first named approach that we came across. Quality circles were the first visible element of a multi-disciplinary attack on quality issues. Production teams could invite designers, production engineers, senior managers and anybody else they wanted to take part in open workshops in which the current issues could be tabled for review. We saw photographs of such sessions in Japanese and Western companies and wondered whether that would work in our business. Would Chief Engineers responsible for the design of a product sit in a group on the shop floor where fitters and machine operators criticised their creation without dropping into defensive mode? Would production engineers seek to justify the established methodology rather than work with operators who just may have better ideas? Could senior managers resist the temptation to take over and dominate such meetings? Could they listen to their proposals being rejected and a consensus view being taken that somebody else had a better idea? Of course, some companies did exactly this. We in MLG have all seen successful case studies and have played our part in implementing such ideas. On the other hand, some spectacular failures have been documented down the years. Such an approach can only work in a culture which lends itself to such open debate and team-working. If the existing culture isn’t yet of this nature we can only adopt Quality Circles as part of a broader change programme. Yes, this may be the extreme, but this remains the undercurrent in many businesses even today. What Toyota and the other Japanese exponents of best practice taught us was that splitting design and manufacturing engineer was not good practice. Building a massive wall between the two areas and discouraging ongoing discussion between the areas simply compounded the mistake. In a true TQM environment everybody understands the company’s aim of supplying quality product to the market and that everybody has to play their part. This brought with it the idea of an ‘engineer’ responsible for design and for production method and tooling. ‘Concurrent engineering’ is what it says on the tin. Many of us in manufacturing at that time may have kept our heads down. Certainly product developers may have tackled the obstacles in the way of jet engines, nuclear-powered submarines and the like. However, did such an approach filter through to the shop floor? Or did we keep attacking symptoms? We may have walked around and watched inspectors and asked ourselves “haven’t they been inspecting those same components for the same problems for as long as I’ve worked here?” We may have suggested that as an alternative we were going to find the root causes of the problems and fix things so that this inspection could stop. In some companies the reaction would have been positive – indeed many companies learned and applied this lesson. In some there would have been incredulity; the thought of components not being examined would have been beyond people’s comprehension. One of our team tells of a sense of despair when a project engineer in his company at the time suggested that they have to identify the reason for a particular recurring problem only to be told that there was no need. “We know why those stems are often distorted. We should heat treat them after milling the keyways.” This was even worse! The problem was understood and it was accepted. Why do we take so long in assembly of . . . ? The spindle never fits first time. Why does the spindle not fit? The housing is machined to loose tolerance. Why is the tolerance so loose? That’s what the drawing calls for. Why is the drawing wrong? The engineer didn’t understand the product. Why didn’t the engineer understand the product? We’re using contract staff to get us over the peak workload in the development phase. In fact we go on to ask if that is really the reason. Perhaps the real cause problem of the assembly problem is that in using contract staff we are launching them into the role with inadequate training. We might then have reason to doubt Ohno. Maybe there is a sixth question here, as to why this is happening. In the case in question the genuine root cause was that the Engineering Manager was being measured on productivity and didn’t want to invest time training people who weren’t part of the ongoing future of the business. Another noted element of this cause and effect approach to quality is the fishbone diagram developed by the academic, Kaoru Ishikawa. This technique is one of the primary tools within quality circles as teams work their way back from the current position to all the numerous factors which may contribute to a problem. In this sense it can be suggested that Ishikawa disagrees with Ohno, saying that cause and effect are not simple ‘one for one’ steps but actually more complex. Perhaps in the above example there may be issues other than the defined tolerance on the spindle. Perhaps there may be problems in the housing? Maybe the bearings are sometimes seated slightly off the vertical? What if changing the tolerances on the spindle drawing wouldn’t solve the problem because the machining process itself isn’t properly controlled and we cannot guarantee producing to a tighter specification? Ours not to reason why, ours but to understand the various techniques and apply them as best meets our needs. There is a distinction, sometimes misunderstood, between Statistical Quality Control (SQC) and Statistical Process Control. We can gather data from quality records and monitor variances in pass / fail rates and trends in the reason for failure and this is often of benefit. However, this SQC is a perfect example of bolting the stable door after the horse has bolted. We may learn and address the problem so that the next horse doesn’t get away but it is not a Quality Assurance technique. SPC, on the other hand, is the introduction of monitoring within the process to highlight trends before they have resulted in non-compliance. We may measure dimensions of components or the temperature within the plant with warnings built in to highlight elements that are varying to unacceptable levels (the process is out of control) or where a particular parameter is heading towards a product being out of specification. A component dimension may have a tolerance of plus or minus 0.03mm with most components falling within 0.01mm. If over the course of a shift the average moves upwards to +0.02mm then more items are likely to fall out of tolerance and we want the monitoring device to highlight this before the danger of non-compliance has increased to significant levels – however we define that. 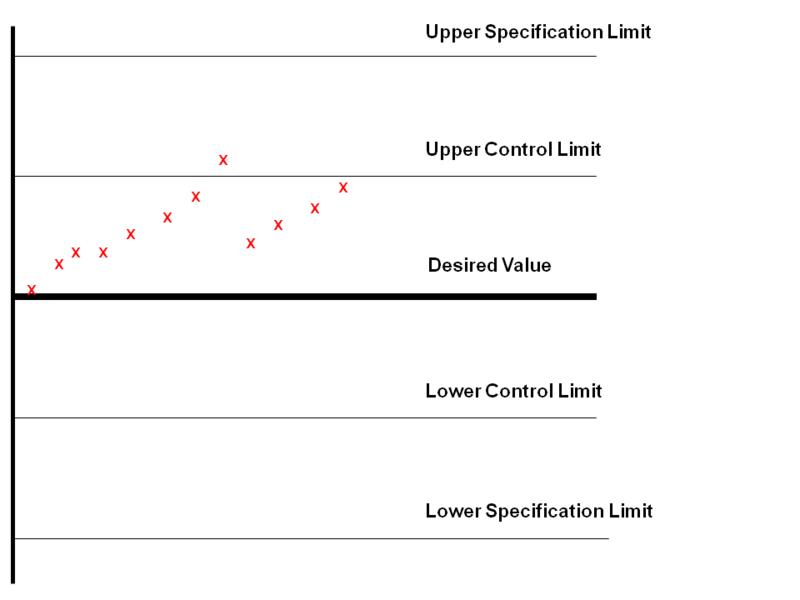 So, SPC is based on the establishment of ‘control limits’ inside the acceptable range of specification. When the measurement reaches this level we have to consider the process and take steps to amend whatever aspect of the process has resulted in the drift towards our product slipping out of tolerance – this would typically be something like tool or shaft wear in an engineering environment. In the example below the length, perhaps of a component has been drifting upward from the outset. When it reached the control limit some corrective action was undertaken. Since then we can see that it has been rising once more. This should result in further action – while product is being made to (‘within’) specification. Contrast this with the old days when the role of a Quality Department role was to inspect and report failure. Of course there are many aspects to Quality, not least that of pride among a workforce of the quality of their environment and processes. The statistical approach, however, leads on to the latest management ‘cure-all’ of Six Sigma. Although we have concerns within MLG over some of the ways that Six Sigma is used – and promoted! – these days we have deemed it worthy of a page of its own on our site, perhaps so that we can point out some of the myths.